The best way to grow ANY business is for your customers to grow it for you. That’s where word of mouth comes in: customers going out of their way to tell other people (prospective customers) about your products and services. Since the cavemen days, this has been the most effective and cost-effective form of customer acquisition. Yet today, even though (and perhaps because of the fact) we are surrounded by advertising options, we almost reflexively design marketing programs that talk TO customers, instead of letting the customers talk with each other. 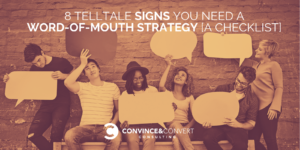 At Convince & Convert, we believe that every company in the world could benefit from a better word of mouth strategy. But some companies need word of mouth more acutely. Are you among them? Advertising is a tax, paid by the unremarkable. If you have to buy every click, every lead, and every sale you simply are working too hard to get new customers. This one is more B2B than B2C. If potential customers show up and don’t know ANYTHING about your company or your offerings, it’s because nobody told them about you first; they just parachuted into your funnel, probably from Google. Unless you have an incredible sales team, those cold leads are the hardest and most expensive to close. Speaking of Google, if very few people are searching for the name of your company or your products/services, it typically means (unless you’re new) that you have insufficient awareness and brand-name demand. That can at least partially be solved with a strong word of mouth strategy. A report from Adobe said that approximately 80% of the average B2B company’s revenue comes from existing customers, in some form. Yet, those companies spend approximately 2% of total budget on customer experience and customer service — the very things that create word of mouth and referrals. 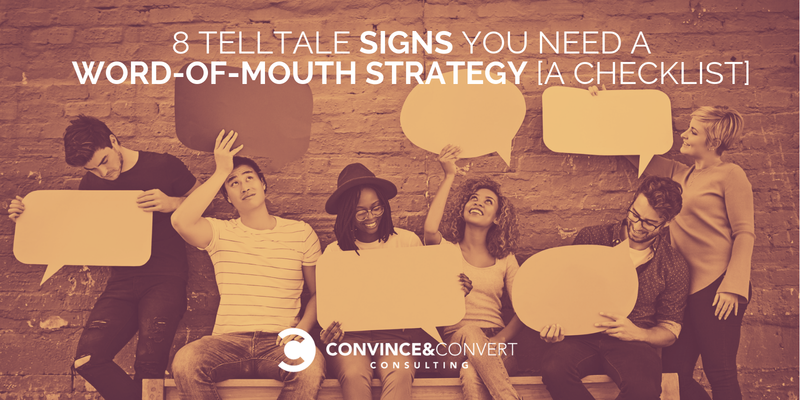 If your marketing and operations budget for customer acquisition is dramatically larger that the budget for CX and retention, you probably need better word of mouth. If your potential customers are looking at you vs. competitors and consistently going with the lowest price, you aren’t giving them anything psychological or emotional that justifies the economics. 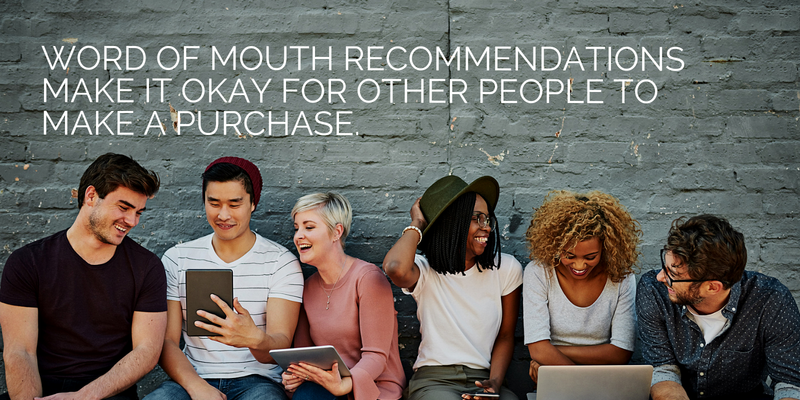 This is one of the great benefits of word of mouth strategy: real people make recommendations that make it okay for other people to make a purchase. Look at Peloton, the wildly popular exercise bike/treadmill and online classes system. Peloton word of mouth is so strong, it’s almost cultish. But the raving fans are what powers the brand. Taken out of context, and absent that word of mouth, it would be tough to justify the expensive bike + the ongoing fees. One thing we know to be true is that competency doesn’t often create conversation. Customers expect you to be competent, so meeting that expectation isn’t particularly talkable. What creates word of mouth are elements of your experience that are OUTSIDE the norm; things customers do not expect. When you have something like that (we call it a talk trigger, and have a whole strategy system for creating them for our clients), it shows up consistently in social media and online reviews. There can be other reasons why your social media is mediocre or worse. But one consistent element of companies that have strong word of mouth is that their organic social gets engagement. Customers WANT to interact with the business, and they WANT to tell the story to their friends. Like social engagement, there can be other culprits here. But, we find that companies with strong word of mouth have a culture aligned around the customer experience, and making it talkable. It’s no accident that those businesses also work hard to create an outstanding experience for their personnel. This is all about the values of company leadership, ultimately. Because if your employees aren’t your biggest advocates, you have problems much bigger than word of mouth. It’s possible to have strong word of mouth without a great corporate culture, but a lot less likely. 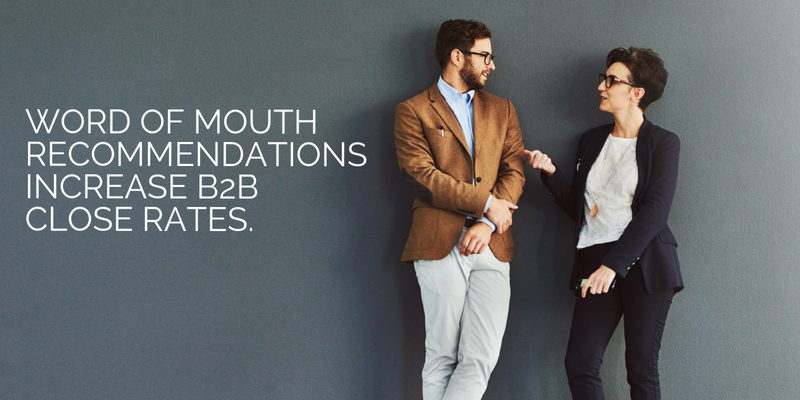 So there you have it: our checklist for whether you need word of mouth in your business. If we can help you, ask us for a free call to discuss. And, we have two Webinars next week (no cost) on this topic. Tune in!